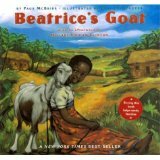 Summary: Beatrice’s Goat is an endearing true story about a little girl and her goat. Beatrice desires to go to school but doesn’t have the money to do so. The goat, a gift to her family, helps pave the way for Beatrice’s dream of going to school to become a reality. Heifer Project International provided the goat which enabled the lives of those in Beatrice’s village to begin to change. Literary elements at work in the story: The story takes place in a small African village of Kisinga in western Uganda. Beatrice lives with her mother and five brothers and sisters. The illustrations are beautiful pictures of Africa, with vibrant colors and engaging paintings. The illustrations invite the reader to step into the village in which Beatrice lives as they help tell the story. Theological Conversation Partners: Mark 12:28-31. God calls us to love our neighbors as ourselves. An act of extending the love of God to our neighbor can be financial, emotional, physical, and/or mental support. For me this story shows the love, care and support we must give to those in need. Have you ever thought you would “never be able” to do something because of limited financial resources? If no, do you know of someone who has had this challenge? How did this make you (them) feel? Did you (they) find a way to do the thing you (they) longed to do? Who or what made it possible for your (their) dream to come true? As Christians, how are we called to help those in need? Think of someone in need or an agency that helps people in need. What can you do to help? How can you show the love of God by helping others? What will you do this week to share God’s love? Beatrice’s Goat by Storypath is licensed under a Creative Commons Attribution-NonCommercial 4.0 International License.